There is a generational gap between old farmers and new. The average age of the American farmer is pushing 60. They are starting to look at retirement, looking to pass the farm on, and looking to get out of the business. The problem is, their kids did not get into farming. This presents a problem as we lose more farmland to development, and we do not have enough new farmers to fill their shoes (and our bellies). Somewhere along the line we skipped a generation, and now are faced with a unique opportunity. There is good news! A new generation of farmers is coming on the scene. The kids of the old generation did not get into farming, but the grand-kids are, and for new reasons. With fresh blood out on pasture there are new ideas, new ideals, and new techniques coming with them. I am happy to be part of a passionate movement toward something wholesome, connected, intelligent, motivated, and inspired. This episode gives you an update on my farming endeavors, I discuss my opinion of the future of farming in America, and I bring on a guest who has some of the best insights on the subject. The power of proving how serious you are. How to use stunts to tell your story and get your message across. How to be braver, stronger, calmer, and more deliberate! 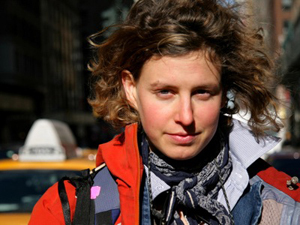 Severine is a farmer, activist, and organizer based in the Hudson Valley of New York. She is the director of The Greenhorns, a documentary film and grassroots organization working to ”recruit, promote and support” the growing tribe of new agrarians. Greenhorns runs a weekly radio show on Heritage Radio Network, a popular blog, young farmer publications, podcasts and many dozens of mixers, Seed Circus and educational events for young farmers, aspiring farmers and families all around the country. Now in their 6th year, The Greenhorns is best known for our documentary film, “The Greenhorns” cut from 380 hours of footage. Both in making the film, and travelling to screen it, Severine has delighted in connecting with hundreds of young farmers in this movement, learning about innovations, collaboration and challenges faced by this next generation of entrepreneurial farmers. Greenhorns actively works to provide venues for networking, bon fires, beer and online communication within a large and growing! network. Severine attended Pomona College and University of California at Berkeley, where she graduated with a B.S. in Conservation/AgroEcology. She co- founded the Pomona Organic Farm, founded UC Berkeley’s Society for Agriculture and Food Ecology, and is a proud co-founder of the National Young Farmers Coalition. What do you think is the future of food and agriculture? What part are your going to play in the future of farming?